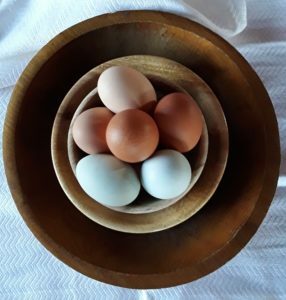 If you have ever kept your own laying hens, you know that there is a time of year when you are over-run with beautiful, healthy, farm fresh eggs. It’s winter and people seem to forget that you have fresh eggs. Or, because, you are in between winter and spring market seasons. Maybe, your cute baby chicks from the fall are now laying eggs and the markets have not started. Whatever the reason; probably, most poultry keepers have been there! So, what are you to do with all of those eggs? Start finding recipes whose star player is the most perfect protein around: the farm fresh egg. 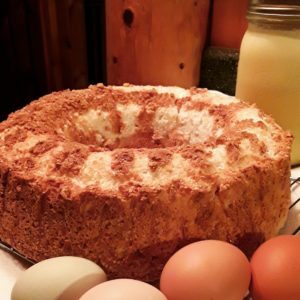 Stepping up to the plate today we have a simple Angel Food Cake recipe. Its delicate touch with a strong presence will make good use of your eggs and be a hit with any crowd. Batter Up! If you are new to baking, there are a couple of terms you will need to understand in order for this simple cake to be a success. Separating – is when you crack the egg and use both sides of the shell to let the whites fall into a bowl, while keeping the yolks in the shell. It is okay if some white stays with the yolk. But you never want yolk in with the whites. Put your yolks in another bowl and save them to make scrambled eggs later. If you want a visual, this short video shows the process. https://www.youtube.com/watch?v=yAGX-54iR30 There are other videos that show the process, using slotted spoons, old soda bottles, or fancy tools. Nonsense! All you need is the egg and your hands, the best tools ever created! Let’s get that Angle Food Cake Recipe going! Separate eggs. Place egg whites in a large bowl; let stand at room temperature 30 minutes. Sift 1/2 cup sugar and flour together twice; set aside. You can sift in a traditional sifter if you have one. Or, take a strainer and shake both ingredients through that, into a bowl. However, if you don’t have either, don’t sweat the small stuff! Just make sure they are both stirred together well. Place oven rack in the lowest position. Preheat oven to 350°. Add cream of tartar, extracts and salt to egg whites; beat on medium speed until soft peaks form. Gradually add remaining sugar, about 2 tablespoons at a time, beating on high until stiff peaks form. Gradually fold in flour mixture, about 1/2 cup at a time. Gently spoon into an ungreased bunt pan or tube pan. Cut through batter with a knife to remove air pockets. Bake 35-40 minutes or until lightly browned and entire top appears dry. Immediately invert pan onto a wire rack; cool completely, about 1 hour. Run a knife around side and center tube of pan. Next, invert cake onto a serving plate. You can eat this cake as a stand alone for sure. Or…you can add a few touches that will make it the star of your meal! For instance, frost the entire thing with whipped cream. Or, as you slice your cake into serving dishes, add a spoonful of whipped cream and a spoonful of fresh berries. Please don’t use Cool-Whip. You just worked hard to make an amazing cake. It is something special. Keep it that way! You can cut this cake through the middle, using a serrated knife, making a top piece and a bottom. To the bottom layer add pudding where you cut and place the top portion of cake on top of the pudding. This is called, filling. You get that baking term for free! The ways to enjoy your cake are only restricted by your imagination. You made a great desert! You used up a bunch of your farm fresh eggs! And, you are probably a very popular person right now! 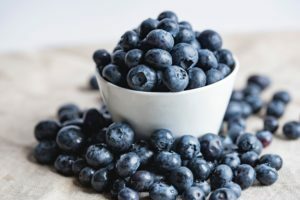 And if by chance, you have more eggs to use up; check out this other fun recipe on our blog https://www.mightyoaksfarmmaine.com/homemade-mayonnaise-recipe/ Thanks for visiting us at Mighty Oaks Farm and Happy Baking!